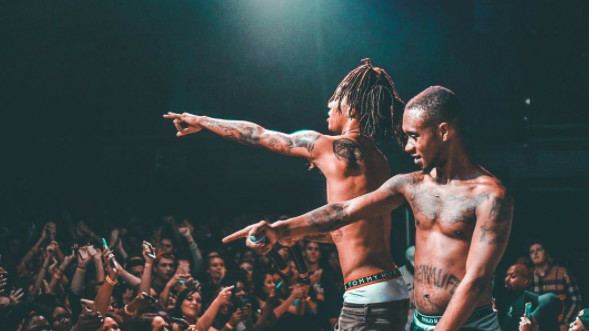 Rae Sremmurd has unfortunately found themselves in a bit of legal trouble, stemming from an incident that took place during one of the duo's high-energy live shows. The group, best known for their viral hit single "Black Beatles," is reportedly being sued for a variety of charges, including negligence, assault and battery, with the suit being filed by a fan who was severely injured at one of their live shows. As reported, Jonathan Marko, a fan from Michigan, suffered the injuries back in October 2016, after being hit in the face by a water bottle that was forcefully thrown into the crowd during the duo's performance. According to TMZ, the bottle of water was thrown so strongly at Marko that it removed "a chunk of his face," as well as resulted in alleged permanent scarring and disfigurement. A graphic photo accompanied the initial report, showcasing the alleged victim's bloodied and stitched-up nose. As a result of the incident, Marko is asking that Swae Lee and Slim Jxmmi cover his medical bills and additional damages, with the total asking amount currently undisclosed. Hopefully, the duo will be able to settle the case as amicably as possible and will soon be able to fully focus on the making of their forthcoming_ SremmLife 3 _album.